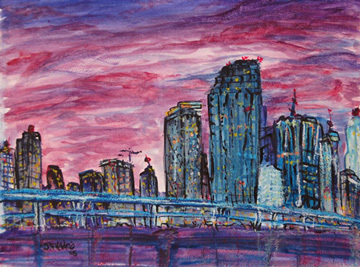 Above, is an original piece entitled, "Downtown Miami 2008" Watercolors, Oil Pastels, & Brushed Ink on Paper 11"x14". See my new art blog. Come back soon for photos and videos from my trip to India!!! Within this webiste you will find paintings, drawings, photography, and artwork inspired by everyday life and interpreted through the eyes and hands of Jonathan Matthew Fields. The work is anything but ordinary. In 2010, Jonathan was featured as a DJ for a Coast Guard Public Service Announcement that aired nationally on MTV. See the commercial on YouTube. 2010, Donated a painting to auction for the Juvenile Diabetes Research Fund. In 2009, his original paintings were featured on season 6 of the hit reality TV show "College Hill"